Since AMD announced its new ‘Hawaii’ line of GPUs a month ago, gamers have speculated about how well the top-of-the-line Radeon R9 290X model would compare to everything Nvidia has to offer. AMD finally unveiled the high-end GPU on Thursday, and we’ve evaluated a reference card on everything from performance to price. We compared it directly to an Nvidia GeForce GTX 780 reference card that we also had on hand. 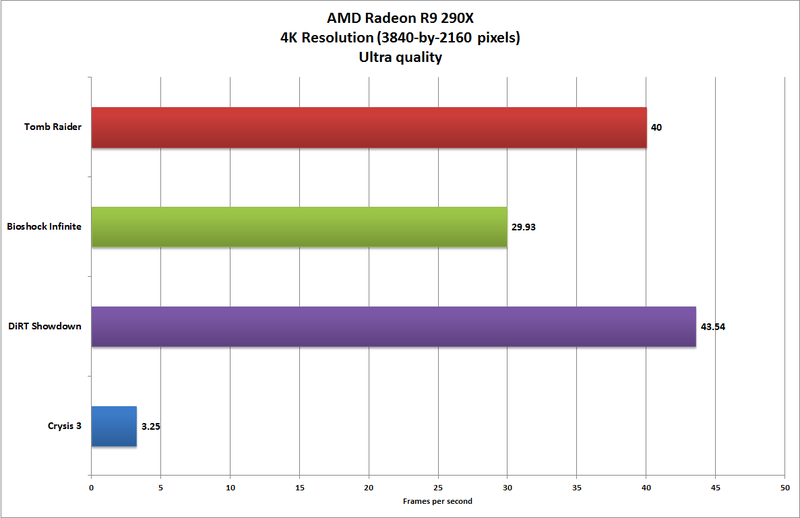 The Radeon R9 290X's full specifications, thanks to GPUz. First, some nuts and bolts: Our Radeon R9 290X reference design carries a 1000MHz GPU clock, a 1250MHz memory clock, and 4GB of DDR5 memory. It boasts 2816 graphics cores and a 512-bit memory interface. It occupies a single PCIe x16 slot. One eight-pin and one six-pin power connector serve to power the card. The Radeon R9 290X includes two BIOS settings. A tiny physical switch on the card lets you toggle between them (the toggle takes effect after a PC restart). ‘Quiet’ mode caps performance and fan speeds to produce a quieter experience. ‘Uber’ mode aims for optimal performance, regardless of the level of noise that results. 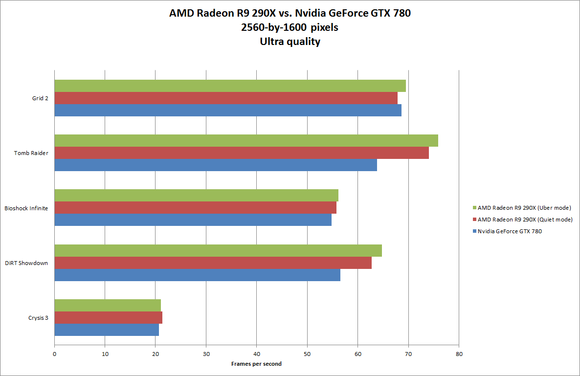 On our game benchmarks, at Ultra settings and a resolution of 2560 by 1600 pixels, the Radeon R9 290X bested the GeForce GTX 780 nearly every time. In our tests, we saw little difference in performance between the two modes—only a few frames per second in some games. In some instances (usually at lower resolutions), Quiet mode slightly outperformed Uber mode. But in either mode, the Radeon R9 290X was a little to a lot faster than the Nvidia reference card. 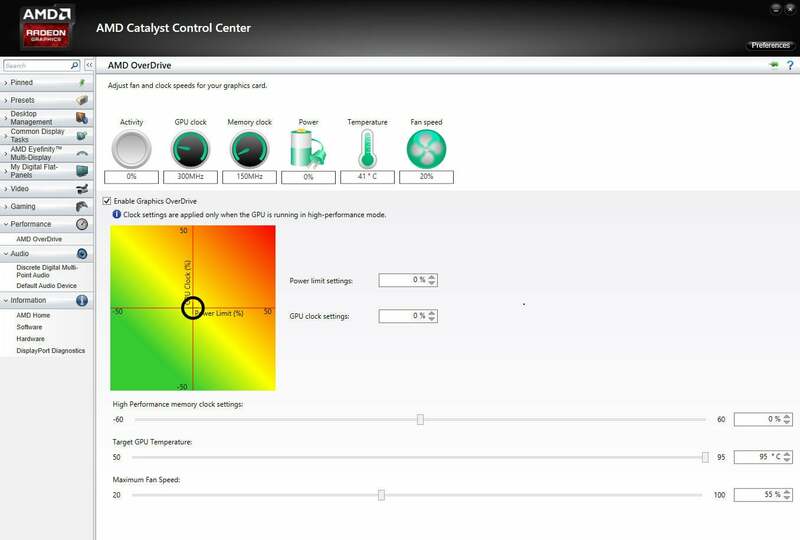 If flipping a switch seems too simple for you, note that the included Catalyst Control Center software has a redesigned OverDrive option for fine-tuning the overclocking of your graphics card. In this utility, you can increase overdriving as a percentage instead of as a clock speed. A two-dimensional heat map, maximum fan speeds, and temperature-target sliders in the software help you customize overclocking without having to mess around in the BIOS. AMD provided a 4K monitor with the card so we could see how well the Radeon R9 290X’s focus on ultra-HD gaming has paid off. To push the card to its limits, we tried every game we had that could reach that resolution, and were impressed by the resulting decent performance. Nearly every game, except Crysis 3, ran at a playable 30 fps or better at Ultra quality—that’s with everything turned up to the max. Frame rates for games running at 4K resolution and Ultra settings were surprisingly good. We measured the card’s running temperature at a blistering 95 degrees Celsius (203 degrees Fahrenheit). AMD said that the 290X can run at that temperature perfectly safely for its entire life, and that there’s no technical reason to reduce the target temperature—though you could lower it via OverDrive. Users who’d like to keep performance up and temperature down, should consider buying and installing a good after-market cooler. Multiple-graphics-card enthusiasts can kiss those annoying, easy-to-lose CrossFire bridges goodbye. With the Radeon R9 290X, you can set up two cards in CrossFire mode simply by installing them on the same motherboard. AMD’s reference design provides two DVI-I connectors, one HDMI port, and one DisplayPort on the mounting bracket. Using AMD’s EyeFinity multimonitor technology, you can connect as many as six displays to a single graphics card. GPUs in the Radeon R9 family now support up to three HDMI or DVI displays (previously the maximum was two), and the rest via the DisplayPort or DisplayPort adapters. There are some limitations, however: All the displays must support identical timings, for instance, and you must configure the display clocks and timing when booting the PC. 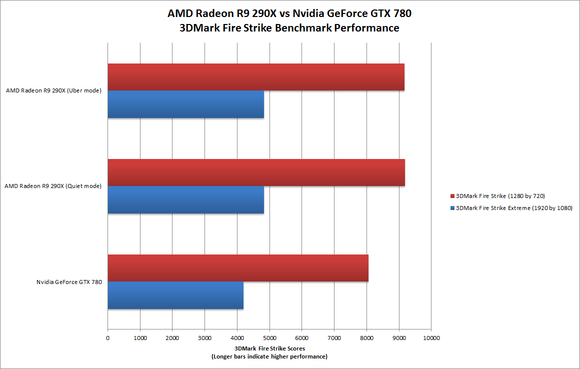 The Radeon R9 290X outperformed the Nvidia GeForce GTX 780 in artificial benchmarks, too. Audiophiles will be pleased to hear that AMD’s True Audio Technology, first included with the R7 260X, appears in the Radeon R9 290X as well. This technology lets programmers use integrated Tensilica HiFi EP Audio DSP cores to process high-quality audio without bothering the CPU. It also removes the CPU from the equation in instances where the CPU might be a bottleneck in sound processing. Developers and programmers have the task of putting True Audio capabilities to good use in future titles. 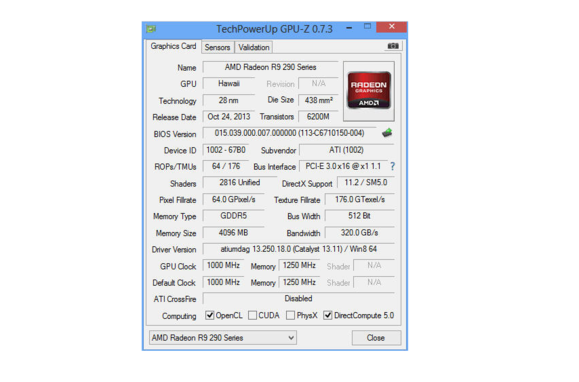 The Radeon R9 290X also uses ZeroCore Power, an energy-conservation feature that powers down the graphics card completely when the PC is in an idle state. A driver monitors tasks and display contents to determine whether applications are no longer actively changing the screen contents, allowing the PC to remain active without drawing power from the GPU. Activities such as file serving, video streaming, motherboard audio, and remote access remain available even in a powered-down state. When the GPU is required, the driver instantly wakes the card. Better things are yet to come. No doubt you’ve heard about AMD’s Project Mantle, the low-level API that gives developers direct access to AMD’s graphics hardware. Programming “closer to the metal” improves a game’s performance and quality. AMD considers Project Mantle a fundamental strength of the entire Radeon R9 series, and the Radeon R9 290X sports it proudly. It will start appearing in games later this year: For instance, Battlefield 4, which launches next week, will incorporate Project Mantle into a free update scheduled for December. Suggested retail pricing for the Radeon R9 290X starts at $549, which makes it about $100 cheaper than the comparable Nvidia GeForce GTX 780. Of course, as retailers release versions with fancy extras, prices could very well reach GTX 780 levels. Based on the results of our hands-on testing, however, the Radeon R9 290X could be the new GPU to beat.